We pride ourselves on our warm and inviting environment. We welcome all — no questions asked! Want to try it out? Just stop by! There are no strings attached... You are welcome the way you are. If your kids are being kids, that's fine with us... Children of all ages are welcome to participate. We say that G‑d might appreciate the children’s noise even more than the adults' prayers! By us, every single Jewish person "belongs." You do not have to be a member, and affiliation is not necessary. And no, there are no dues. You do not have to pay to pray. We value your input in every area, and would love to hear what you think. 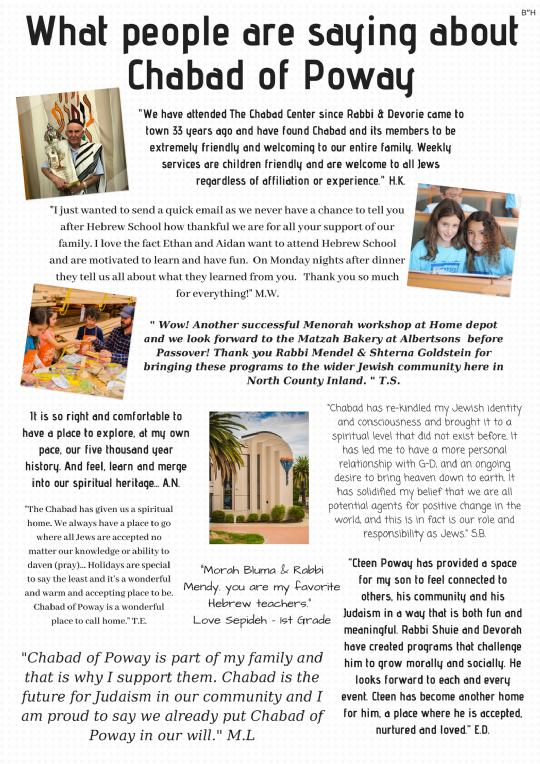 Our shul serving Rancho Bernardo, Poway and 4S-Ranch community, has been built just for you. The place is gorgeous... You should come just to check it out! The Rabbi will pepper the service with interesting thoughts and ideas regarding Prayer, the Torah, and Judaism in general. If you think Prayers are boring and stale, you have not been here yet... Between the singing, explanations, and insights, the Services are brought to life! Want a long sermon on the Parsha of the Week? Go somewhere else! Want predictable answers? This is not the place for you. But if you want a stimulating give-and-take which is actually relevant, then give us a try. Following Services, we sit down for a delicious Kiddush... You will not leave hungry! Our Rabbi really means it! Our Rabbis are dedicated to making everyone feel comfortable. They will go out of their way to accommodate you. They are equally committed to teaching authentic Judaism in a friendly way. To that end, they will address issues and answer your questions honestly and sensitively.